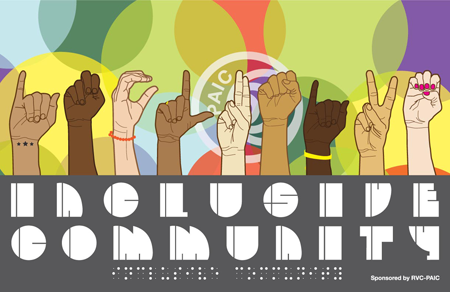 In January of 2011, the Promoting an Inclusive Community (PAIC) Committee of Rock Valley College chose RVC student Amphone Thammavong’s design as the winner of its diversity poster design contest. RVC students were asked to explore fundamental components of diversity and use their artistic skills to capture their understanding and vision of an inclusive community. Thammavong’s winning design has been displayed campus-wide ever since as a visual representation of Rock Valley College’s commitment to inclusion. Sister Helen Prejean, author of Dead Man Walking: An Eyewitness Account of the Death Penalty in the United States, was the guest lecturer at the Inagural David H. Caskey Memorial Lecture Series for the Advancement of the Social Sciences on March 2, 2011. Over 700 guests packed the Physical Education Center to hear the lecture. Sister Helen Prejean has been instrumental in sparking national dialogue on the death penalty and helping shape the Catholic Church’s newly vigorous opposition to state executions. Dead Man Walking became a movie (Susan Sarandon won an Oscar for her portrayal of Prejean in Dead Man Walking), an opera, and a play for high schools and colleges. Since 1984, Sister Helen has divided her time between educating citizens about the death penalty and counseling individual death row prisoners. The Rock Valley College Philosophy Department, in conjunction with the Rock Valley College Foundation, made Sister Helen’s appearance possible. Mary Caskey (left) with Sister Helen Prejean (right) after Prejean’s lecture at RVC in 2011. Rock Valley College student Stacey Slintak was named to the All-USA Community College Academic Team. Only 20 students from more than 1,600 nominations were selected, and Slintak was the first RVC student to ever achieve this prestigious honor. The All-USA Community College Academic Team is presented by USA TODAY and Phi Theta Kappa (the official honor society of two-year colleges) and is sponsored by Follett Higher Education Group. Slintak was featured in the USA TODAY newspaper and was presented a $2,500 scholarship and a special medallion at Phi Theta Kappa’s Presidents Breakfast held during the annual American Association of Community Colleges (AACC) Convention on April 11, 2011, in New Orleans, Louisiana. As the top scorer from the state of Illinois, Slintak was also recognized as a Coca-Cola New Century Scholar. This honor, sponsored by the Coca-Cola Foundation and Coca-Cola Scholars Foundation, included an additional $2,000 scholarship. Slintak also received the Guistwhite Scholarship, which is considered the highest Phi Theta Kappa recognition. Due to her academic achievement and leadership in Phi Theta Kappa, she received $5,000 for completion of her baccalaureate studies. Back on November 6, 2010, Slintak also accepted a medallion from Illinois Governor Pat Quinn for being named the 2010 Lincoln Academy Student Laureate for community colleges. Slintak graduated from Rock Valley College in May of 2011 and served as the Student Speaker at commencement. 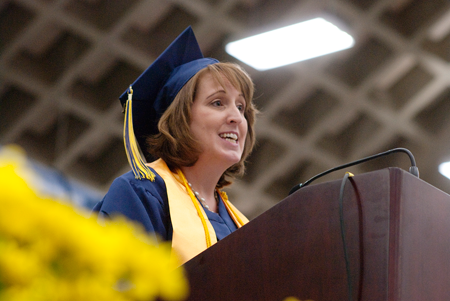 Stacey Slintak gives the student address at the 2011 commencement ceremony. 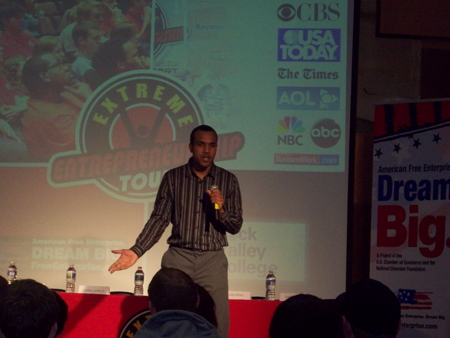 On Friday, April 15, 2011, Rock Valley College welcomed the Extreme Entrepreneurship Tour to the college to inspire youth and young adults to create their own path. The Extreme Entrepreneurship Tour – the first ever collegiate entrepreneur tour – included keynotes, exhibits, workshops, and question-and-answer sessions with young entrepreneurs. Students were also able to brainstorm with business professionals and meet like-minded students through networking events. The event was sponsored by RVC Student Life, RVC SIFE (Students in Free Enterprise), the Rock Valley College Foundation, and The Coleman Foundation. Founded by award-winning entrepreneurs Michael Simmons and Sheena Lindahl when they were just 25-years-old, the tour is comprised of many of America’s top young entrepreneurs who’ve made, earned, or sold a company for millions and/or made a huge impact before the age of 30! The vision of the tour is for all of America’s college students to graduate with an entrepreneurial mindset. 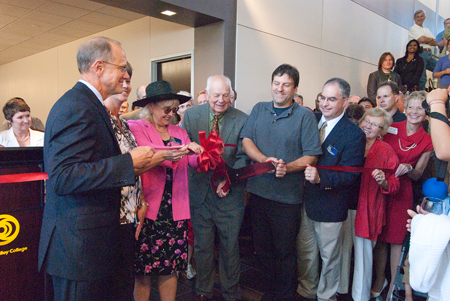 The college and community celebrated the opening of the Karl J. Jacobs Center for Science and Math with a special ribbon-cutting ceremony on August 16, 2011. Family, friends, and RVC retirees joined current RVC faculty and staff as well as community members and local dignitaries to celebrate the opening. Dr. Jacobs served as president of Rock Valley College from 1969 to 1997. During his tenure multiple academic programs and building projects were formed to serve the region. Highly respected by local leaders, Dr. Jacobs sought to meet community needs through academic and career programs at Rock Valley College. Classes officially began in the new building on August 20, 2011. Dr. Karl Jacobs did the honors to officially open the building in his name. Lt. Governor Sheila Simon visited Rock Valley College on October 6, 2011, as the final stop on her Complete Community College Tour. What are you doing to improve completion rates? What are you doing to connect students to the workforce? What completion challenges are you facing that would benefit from state assistance? Over the course of several months, Simon spent about 90 minutes at each college. At RVC she visited with students, faculty, and administrators at RVC to hear their stories. Simon came away particularly impressed with how RVC had redefined its developmental math program to better meet the needs of students and help to ensure their success. Students shared great stories about how they have overcome challenges to pursue their degrees. They also shared their gratitude for RVC and the support they have received from everyone inside and outside the classroom to help them be successful. Lt. 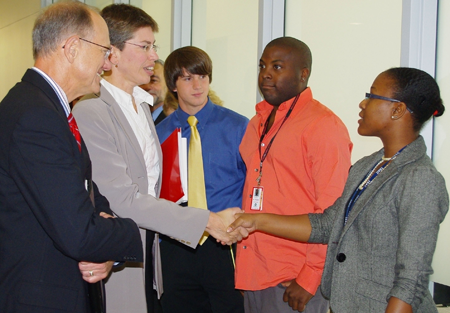 Governor Sheila Simon greets RVC students on the final stop of her Complete Community College Tour in 2011. 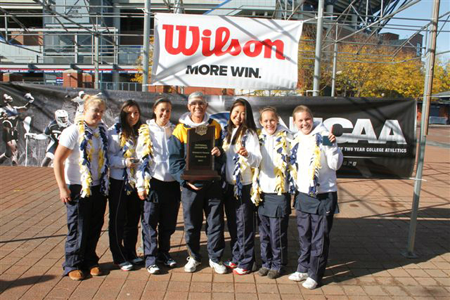 The Golden Eagles women’s tennis team got off to a hot start at the NJCAA national tournament and never looked back as they rode that early momentum to a dominant national championship performance in October of 2011. RVC tallied 33 team points, easily topping second place finisher, Mercer (New Jersey). Five Golden Eagles were named NJCAA All-Americans: Katy Kurilla (first team and tournament MVP), Nicole Beck (first team), Brianna Todaro (first team), McKenzie McCray (second team), and Alice Swanson (second team). RVC head coach Steve Vee was named NJCAA Division III National Coach of the Year for the fourth time as this was the fourth time he led a Rock Valley College tennis team to a national title. He took the men to national titles in 2000 and 2002 and previously led the women to a national title in 2004. 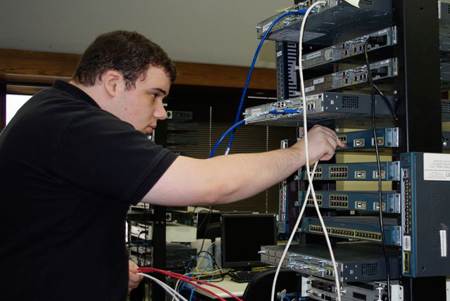 Rock Valley College student Casey Schoonover won the Cisco Networking Academy NetRiders competition, a competition that started with 709 participants representing 39 states and six provinces in the U.S. and Canada. Schoonover advanced through three competitive rounds and won first place on December 2, 2011, in a final round that included 44 competitors. Cisco Networking Academy NetRiders is a great opportunity for students and alumni to showcase their IT/Networking skills and gain visibility among talent recruiters in the growing ICT and networking field. The competition is organized by Cisco as an opportunity for Networking Academy students to participate in a valuable learning experience by testing students’ Networking/IT skills through a series of online exams and simulation activities using Cisco Packet Tracer that cover CCNA (Cisco Certified Network Associate) material. Each year, over 10,000 Cisco Networking Academy students compete in NetRiders events in over 80 countries across the globe. As a grand prize winner, Schoonover won a study trip prize to San Jose, California for the week of January 8-14, 2012, where he joined 13 other international winners coming from Brazil, Chile, Dominican Republic, Germany, Malaysia, Mexico, Philippines, Romania, Slovakia, and South Africa.